A very merry unbirthday! Yesterday marked six years for the blog, and you know what that means?!...GIVEAWAY! Celvoke Voluntary Eyepalette in 04 and 05. 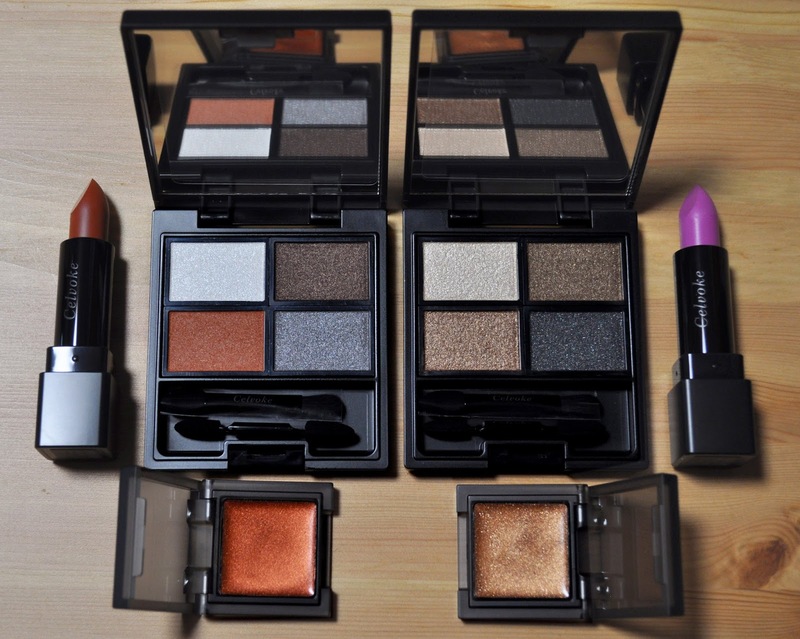 Celvoke Infinitely Color (can be used on the eyes, cheeks, and lips) in 01 and 02. Celvokes Dignified Lips in 08 and 09. I didn't ask, but the SA was kind enough to give me another gift with purchase set. 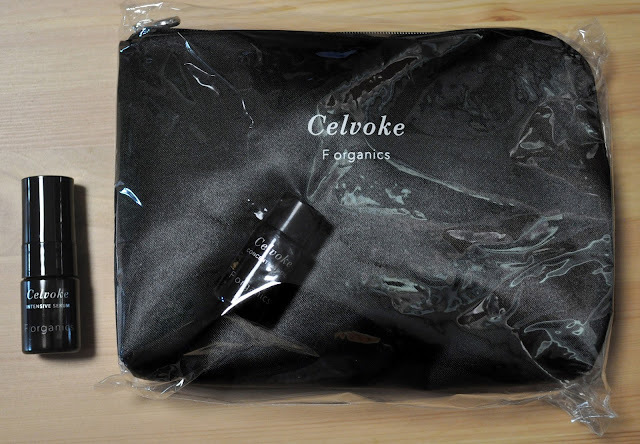 So, because of that, the winner will also get this black Celvokes bag, and two travel samples of the Intensive Serum and Concentrate Oil. All you have to do is tell me what your favorite Autumn beauty products are in the comments, or share images of them on Instagram. Easy and simple! Open internationally, you have to be a member of the blog under "The Enablers," as well as my Instagram. Because I started the giveaway a day late, I will be announcing the winner on the blog and instagram on October 10th. Good luck, and I look forward to reading your favorites. Happy 6th birthday to your blog, Lizzy! Nars Goulue blush - such a beautiful warm berry. I think it suits a wide range of complexions. Dose of Colors Brick liquid lipstick - a terracota shade that pairs beautifully with burgundy eyes! Milani Amore Creme liquid lipsticks - Embrace (original formula) is a vampy and vibrant purple orchid shade. I love the OG formula and wish they never reformulated! THREE Feeling the Flow blush - a dark berry shade for flushed autumn cheeks. - balms.. any beauty balms, cleansing balms, as long as they're a bit green and hippie. :D I love the Mahogany Naturals and Mahalo beauty balms especially. - That NARS Soft matte long name concealer you also reviewed. I'm completely obsessed! - Also Dior has a (discontinued?) sheer corrector click brush pen, which I love underneath. Autumn means lots of work for me, so concealer is needed. I think Dior does have an equivalent corrector with a slightly different brush nowadays. - Cream eyeshadows in general. Especially Tom Ford! They're a classic. - SUQQU Extra Rich Cream Foundation mixed with ADDICTION Skincare foundie. I love the SUQQU but it's too dark for me most of the year.. Now after Summer time I'm a bit more on the tanned side, so I mix it a bit with the lightest Addiction shade and oh it's gorgeous! Sulwhasoo First Care Activating Serum EX, Swanicoco Peptine Care Skintoner (full of softening peptides! ), Sulwhasoo Hydro-Aid Gel Creme and History of Whoo's Gongjinhyang Eye Cream (after I started using this guy it seemed like everything else I used before was useless). Not to forget sunscreen, the only one that does not seem to cause congestion, breakouts or irritation for me is Tatcha's Pore Perfecting Sunscreen. Congrats on your six year anniversary!! My favourite fall products are mostly lipsticks because I've been trying to avoid eyeshadow. I'm loving the Maybelline Supermatte Liquid Lipsticks as they are nearly immovable (my current vampy shade is Believer, but it's been too hot to wear it). I'm also liking Urban Decay Naked Heat although I'm still working out how to wear red eyeshadow. My favorite product for fall is Chantecaille Rose Body Oil. It moisturizes my skin but doesn't leave it greasy.